View 2018-19 Kick-Off Luncheon photos. The Adopt-A-School program aims to bring more community involvement to Lincoln Parish public and private schools through pairing schools with community partners – businesses, churches, civic groups, even individuals. The Chamber and Lincoln ACHIEVE facilitate the AAS program. Adopters are paired with schools – generally the adopters request the school of their choice. If an adopter doesn’t have a specific school with which they would like to work, we pair them with a school. When the pairings are complete, the schools receive contact information for each of their adopters and the adopters receive contact information for each of the schools they’ve adopted. There is an annual kick-off luncheon during which schools and their adopters have time to visit with each other and discuss plans and projects for the school year. How much the partner is involved with the school is up to the partner. Some of our partners help fund items that their partner school needs but can’t otherwise afford (for example, one year a partner purchased two VCRs for their school). Other partners volunteer to read to the children, or tutor, or provide pizza for honor roll students. Others participate in career days, provide pencils for test-taking, etc. There is no fee to participate in AAS, nor is there any requirement that partners make any financial commitment. We urge the partners to stay in contact with their schools so that they can find out how they might be assistance - it's important to us that the partnerships are customized to meet the unique needs of both the community stakeholder and its education partner. We also urge our schools to show appreciation to their partners. Some schools invite their partners for lunch, others send artwork to be displayed at the business, or other thank-yous from the students. Each partner receives a certificate that we hope they display citing their participation in the program and naming the school(s) they’ve adopted. Likewise, each school receives a poster saying they have been adopted by your business/organization. Schools are urged to display the posters so that everyone visiting the school can note the business/community partnerships. 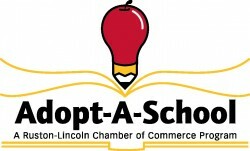 For more information about Adopt-A-School, or to become an Adopt-A-School community partner, contact Ivana Flowers at the Chamber, 255-2031 or email iflowers@rustonlincoln.org or Cox-Boniol at 255-1430, or ccox@lincolnschools.org. Quarterly Partnership Post newsletters are available to read or download below. Beta Sigma Phi, Eta Omicron Chap. Grambling Alumni Chap. of Kappa Alpha Psi Fraternity, Inc.
John Belton, 3rd Judicial Dist. Atty.